That isn’t to say the Cowboys don’t have any competition. The New England Patriots are closing the gap with a seven percent increase in relevance compared to the original rankings from the beginning of the season. By analyzing how 7.1 million U.S. sports fans are connected to teams, sports brands, events, athletes and sports reporters, the center was able to develop the NFL Relevance Ranking for every team. Relevance over time is incredibly important for American sports teams as it accurately conveys how emotionally connected fans are to their teams. The biggest increase in relevance score belongs to the two new Los Angeles teams — Chargers and Rams (14 percent and 13 percent), respectively. With a 14 percent increase, the Chargers jumped three spots to No. 26 in the rankings. Record-wise, the Chargers sit just below .500 at 3-5 and only two games out of first place in the AFC West. Given the team’s well-known attendance issues, one would assume the Chargers are struggling to connect with their new city. But spearheaded by a top-10 scoring defense and individual stars like defensive end Joey Bosa, linebacker Melvin Ingram and running back Melvin Gordon, the Chargers are trending in the right direction with Los Angeles sports fans. On the other hand, the Rams’ 13 percent increase could largely be based on the team’s surprising 6-2 start. Not only are the Rams leading in the NFC West, but young skill position players — RB Todd Gurley and quarterback Jared Goff — are coming into their own and establishing themselves as the future of the franchise. As a result, Los Angeles fans have responded positively. 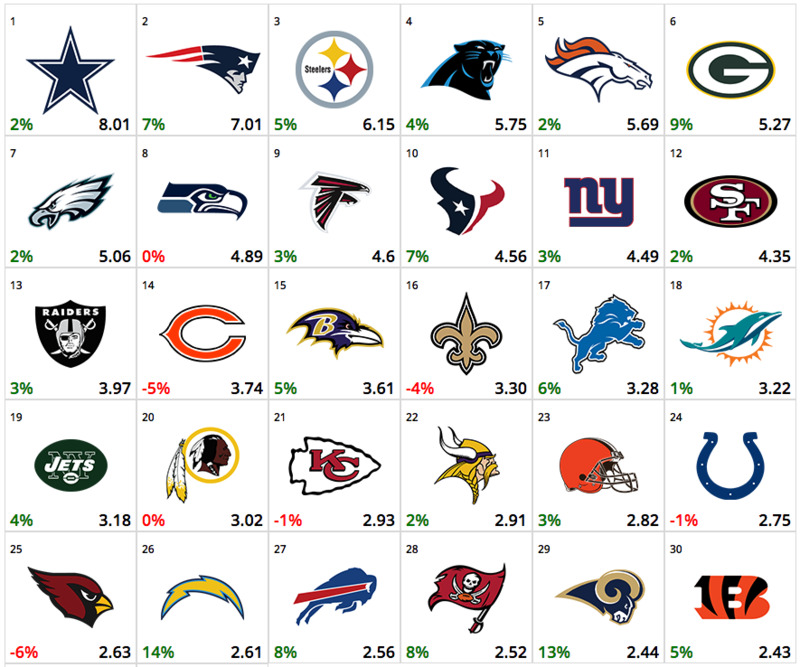 The biggest drop in the rankings goes to the Chicago Bears and Arizona Cardinals. Both teams are off to disappointing starts, especially Arizona, which suffered a season-ending injury to arguably the league’s top RB David Johnson in Week 1. Consequently, the Cardinals have yet to recover. They currently hold a 4-4 record and are without starting QB Carson Palmer for the foreseeable future. One interesting team to watch as the season enters the second half is the Houston Texans. The first half was very good to the Texans, despite losing superstar JJ Watt to a season-ending injury and their relevance increased by seven percent, placing them into the top 10 overall. Unfortunately, stud rookie QB Deshuan Watson’s ACL tear has derailed a lot of the fan base momentum. Without the excitement of Watson and the below average play of backup Tom Savage, it’ll be interesting to see if the Texans can continue their positive momentum, especially if the record falters. The winless San Francisco 49ers held strong with a two percent growth and only falling one spot. Despite the 0-9 record, it appears the fan base is strong and understands that 2017 and maybe next season will be primarily rebuilding the franchise in hopes of returning to the success it had back in the 1980s-1990s. Small-market franchises Tennessee and Jacksonville hold down Nos. 31 and 32, even with both teams tied for first place in the AFC South. Even an Aaron Rodgers injury and a .500 record can’t derail the relevance of the Packers to its fans. Green Bay jumped two spots to No. 6 with a nine percent increase. The relevance rankings are based on a deep dive into social media data from millions of US sports fans. Samford University's Center for Sports Analytics and Affinio, a big data consumer insights company in Canada conducted the analysis.